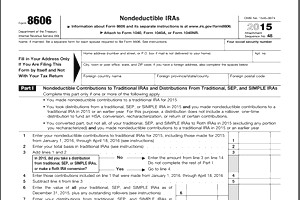 What Happens If You Forget to File Form 8606 for Nondeductible IRAs? Tax time can require filing various IRS forms, all of them tagged with vague, hyphenated names that seem to have no correlation to the purpose they serve. It's easy enough to get confused. Form 8606 is the one you're supposed to file for nondeductible contributions made to an individual retirement account (IRA). But what happens if you forget to do so or if you don't even realize that you were supposed to? Don't panic. It's not the end of the world. Nondeductible contributions to an IRA are made with after-tax dollars and this is a major distinction. You've already paid taxes on this money, so these contributions don't offer you a tax break in the year you make them. So why bother? Why not contribute to a traditional IRA instead and deduct those contributions from your taxable income at tax time? First, not everyone can make deductible contributions to a traditional IRA. The IRS limits your deductible contributions if you or your spouse are covered by a retirement plan through your employer. Some income limits also apply. Some taxpayers find that they have no other choice but to make nondeductible contributions if they want to save more for retirement. The growth of nondeductible contributions is tax-deferred. You don't have to pay taxes on any gains until you withdraw them. But you don't have to pay taxes on your own contributions because you've already been taxed on that money. Your nondeductible contributions serve as your basis in the IRA for tax purposes. The IRS wants to know about and keep track of your nondeductible contributions so that it all works out in the end when you're retired and start taking that money. Let's say you made five nondeductible IRA contributions in previous years, and you failed to file Form 8606 in any of those years. You never deducted the contributions on your tax return, either. If you submit Form 8606 now for each of those years, it might satisfy the IRS without incurring a penalty. Although Form 8606 is normally submitted with a timely-filed Form 1040, the IRS will process a late-filed Form 8606—even one that is filed after the normal three-year statute of limitations for claiming a refund has expired. The Form 8606 can be submitted without a Form 1040 or a Form 1040X. Let's take this scenario one step further and say that you're 66 years old, and you've never taken a distribution. You file one Form 8606 for each year you made a nondeductible contribution. This will establish your basis in the IRA. You would then be eligible to either convert your nondeductible IRAs into Roth IRAs, or you could begin taking distributions from the nondeductible IRAs. And no, according to the IRS, you don't have to file an amended return. You have additional options for IRA contributions if you made them within the last three years. The IRS allows you to treat them as either deductible or nondeductible—it's your choice, assuming you qualify to make deductible contributions. If you want to claim the deductions, you would have to file an amended tax return using Form 1040X. You would have to do so for each year you want to go back and claim the deduction. But you can only do this within three years of the original filing deadline. If you want to claim an IRA deduction for the 2016 tax year, you would have to file an amended return by April 15, 2019, the last day to claim a tax refund for that tax year. Consider working with a tax professional to help you figure out if doing this or converting to a Roth IRA would make the most financial sense for you at this point. The penalty for filing Form 8606 late is $50 for missing forms up through the 2017 tax year. The IRS sometimes waives this penalty if you can show reasonable cause for the delay.